Fulgurite is a hollow tube of molten sand caused by a lightning strike. By the heat of lightning impact the sand melts and forms a tube. It is also called petrified lightning because the fulgurite hardens in the form of the lightning strike. 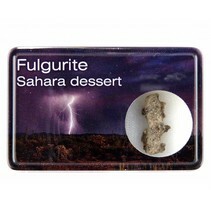 This fulgruieten come from the Sahara Desert and are formed during rare but severe thunderstorms. Most fulgurite is found in hollows. Lightning strikes in the desert usually on the low points because it is closest to groundwater.